There are so many issues affecting oil prices these days that analysts are all over the map on forecasts for oil prices. At the bottom of the forecast range is Citi bank which says that Brent soon could fall back into a trading range of $45 to $65 a barrel. Goldman Sachs is in the middle forecasting a $70-80 range for Brent, while Bank of America says that Brent could rise to $90 by the second quarter of next year. However, the Bank says that should Iranian exports be completely cut off then there would be a price spike above $120 a barrel. An interesting outlier from economist Philip K. Verleger suggests that oil prices could increase to $200 a barrel solely because of new regulations on sulfur emissions for maritime fuels which begin in 2020. Some believe that the markets are ignoring the risks of tightening supplies. These analysts note that the expected increase in oil exports from OPEC and Russia has not materialized and that reports of spare Saudi capacity that will be brought into production are overblown. The attack on two Saudi oil tankers in the Strait of Bab El Mandeb by Yemeni Houthi forces could presage more troubles in the area. The Bab El Mandeb is not militarized by US-NATO naval forces – which means it is far more exposed to attacks than the Strait of Hormuz. OPEC: Last May a bill was introduced in the US Congress that would let the US sue OPEC for oil price fixing. The proposed law is called “No Oil Producing and Exporting Cartels Act,” or NOPEC. Last week, two Republican Senators and two Democrats introduced legislation aimed at allowing the government to bring lawsuits against OPEC members for antitrust violations. If passed, this bill would be an amendment to the Sherman Anti-trust Act of 1890. One of this act’s central provisions outlaws all combinations that restrain trade between states or with foreign nations. This prohibition applies not only to formal cartels but also to any agreement to fix prices, limit industrial output, share markets, or exclude competition. In 2007, a similar bill passed in the House of Representatives with a 345-72 vote, and in the Senate by 70-23, only to fail afterward in the face of White House opposition. This time around, however, there is a good chance that Trump would sign such a bill into law. Such a US law could cause considerable mischief by endangering US-Saudi relations. US Shale Oil Production: In its biggest deal in nearly 20 years, BP has agreed to buy US shale oil and gas assets from Australian miner BHP Billiton for $10.5 billion. The acquisition will give BP access to some of the most desirable acreage in the US shale basins where BP’s scale of operations can provide a considerable advantage. Big oil companies have historically focused more on large offshore projects, but they are increasingly sinking money into shale developments that start producing and making money faster. BHP will book a roughly $2.8-billion charge against assets for its 2018 fiscal year. BHP paid a combined $20 billion to acquire its US shale assets in 2011, and then spent billions more to explore and develop them. But a collapse in oil prices in 2014 resulted in significant losses, including a more than $7-billion pretax charge in 2016 that is its largest-ever single write down. The BHP experience in US shale oil once again raises the issue as to where US shale oil is going and just who is making money from wells that are mostly used up in two to three years. 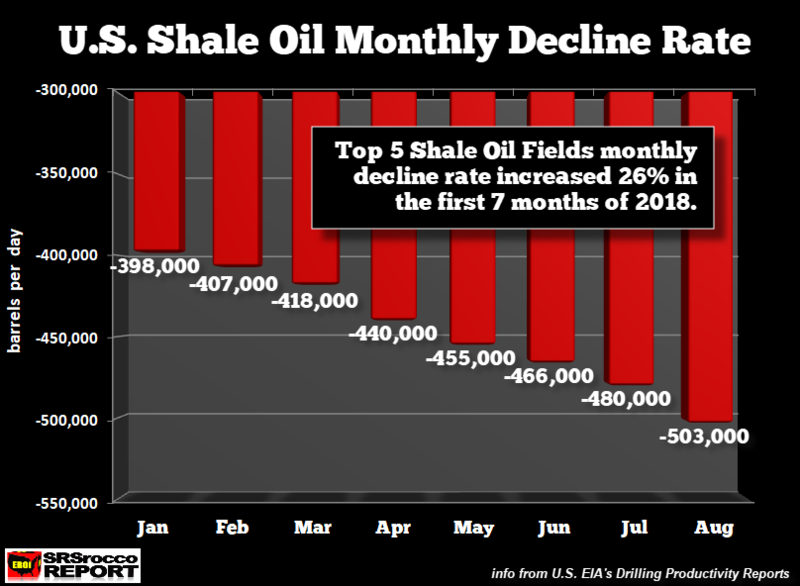 While the US reached a new record of 11 million barrels of oil production per day last week, the top five shale oil fields also suffered the highest monthly decline rate ever. This is terrible news for the US shale industry as it must produce more and more oil each month to keep oil production from falling. 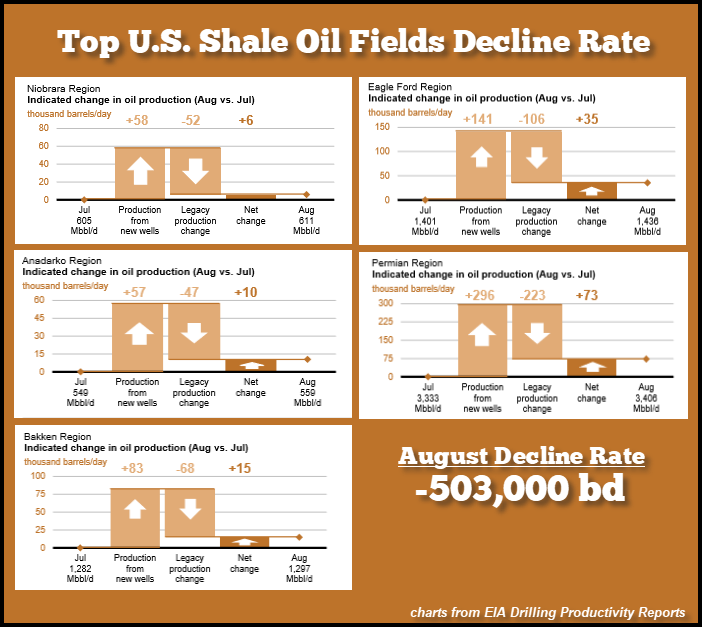 According to the newest EIA Drilling Productivity Report, the top five US shale oil fields monthly decline rate is set to surpass a half million b/d in August. Thus, the companies will have to produce at last 500,000 barrels of new oil next month to keep production flat. In the charts that are shown above, the UP arrows denote the forecasted new output added from new wells opened during August while the figures above the DOWN arrow provide the monthly decline in production from wells opened any time before the current month. For example, the chart on the bottom right-hand side is for the Permian Region. The EIA forecasts that the Permian will add 296,000 b/d of new shale oil production in August, while production from the existing wells in the field will decline by 223,000 b/d during August from the previous month. Thus the whole Permian Basin is forecast to produce 73,000 b/d more oil in August than in July. However, the EIA forecasts that these five largest US shale oil fields will produce 635,000 b/d of oil from newly drilled wells during August resulting in a net increase of 360,000 b/d for the month. For September, the 635,000 b/d from these new wells will start to decline rapidly and add to the decline from “legacy” (more than one month old) wells. At some point in the months ahead, the shale oil industry will not be able to drill enough new wells in a month to keep up with the rapid decline from existing wells. Like the red queen in Alice in Wonderland, the shale oil industry must drill faster and faster just to keep production level. Pioneer Resources is the largest shale oil producer in the Permian. The company spent $818 million on capital expenditures for additions to oil and gas properties (drilling and completion costs) during the first quarter of 2018, opened 63 new horizontal wells in the Permian, but added 9,000 b/d of oil equivalent over the previous quarter. Pioneer reported $554 million in cash from operations and spent $818 million drilling and completing oil wells in the Permian and a few other locations. Therefore, the largest shale oil producer in the Permian spent $264 million more than they made from operations drilling 63 new wells in the Permian and only added a net 9,000 barrels per day of oil equivalent. 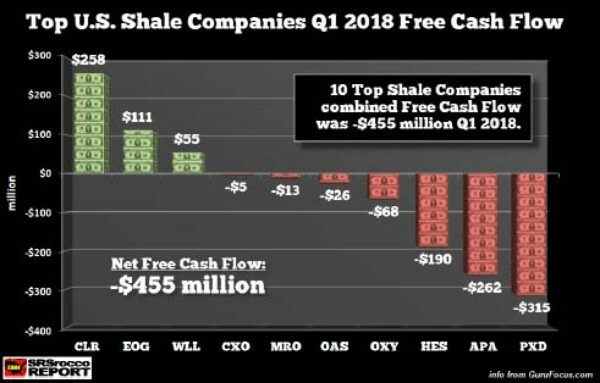 Of the ten shale companies in the chart above (in order: Continental, EOG, Whiting, Concho, Marathon, Oasis, Occidental, Hess, Apache & Pioneer), only three enjoyed positive free cash flow, while seven had free cash flow losses. The net result of the group was a negative $455 million in free cash flow. These losses are taking place even with oil prices at levels that are supposed to be profitable. It is going to take many years of much higher oil prices to recoup the losses the shale oil industry is suffering. Even if oil prices increase significantly in the years ahead, the question is whether there will be enough shale oil left to ever pay back the losses. Iran: Last week was marked by threats and counter-threats between Washington and Tehran over the impending US sanctions. At times the rhetoric reached unprecedented levels. The most interesting feature of the week was how little reaction there was in the oil markets which have long been accustomed to inflammatory rhetoric emanating from Tehran, but are getting used to the same class of threats from Washington. Tehran’s most potent bargaining chip is the ability to halt, or at least attempt to block, oil exports through the Straits of Hormuz. As this would cut off roughly 30 percent of the world’s seaborne oil supplies and much of the oil going to many nations, major hostilities would almost certainly result within hours of an Iranian effort to stop oil tankers transiting the Straits. The exchange of harsh rhetoric resulted in many commentaries as to whether Tehran would ever undertake such a move as it would surely result in unprecedented hardships for Iran. More sophisticated analyses point out that while blocking the Straits would be tantamount to suicide for Tehran, they have other options such as the attacks on two Saudi oil tankers transiting the Bab al Mandeb Strait in Yemen and Djibouti last week. These attacks resulted in the Saudis temporarily closing the Straits to their oil tankers. By using the Houthi insurgents in Yemen as cutouts in attacks on oil traffic going through the Suez, Tehran could obtain some additional leverage in its dispute with Washington without the risks of open confrontation. This confrontation has months or even years to play and there are many dangers along the way. Iraq: For the past three weeks, Iraq was rocked by protests. They began in the southern province of Basra, home to over 70 percent of Iraq’s oil reserves, and quickly spread to the rest of the country. Despite Basra’s oil wealth, people lack basic amenities such as clean water, electricity and waste management. They accuse the government of widespread corruption and are demanding sweeping changes. Electricity service collapsed across several provinces in Iraq on Thursday due to technical failures, as protesters continue to rail against government corruption and incompetence, including renewed demonstrations at oil fields. Power generation came to a halt in Basra, Dhi Qar, and Missan provinces mid-day on Thursday, but began to come back online by early evening. Kirkuk and Ninawa provinces were also affected, according to statements from the Ministry of Electricity. Saudi Arabia will ship fuel to Basra in order to help Iraq through its electricity crisis and to keep its power flowing, according to reports on Saudi Arabian state TV. The report said large amounts of fuel would be transported to Iraq from the port of Dammam in Saudi Arabia. Power cuts started last week across Iraq after Iran cut electricity and fuel supplies to the country over payment disputes and protests continue across the country as a result of the electricity crisis. Despite the protests, Iraq’s oil exports continued to increase last week and averaged around 3.5 million b/d; however, the energy sector remains vulnerable if the protests continue. Last week at least two minor attacks including a small roadside bomb were launched against oil facilities. The political crisis stemming from the disputed election results continues with no end in sight and few important decisions about the future of the country being taken. Saudi Arabia: Riyadh said on Thursday it was suspending oil shipments through the Red Sea’s Bab al-Mandeb Strait, one of the world’s most important tanker routes, after Yemen’s Iran-aligned Houthis attacked two ships in the waterway. Saudi Energy Minister Khalid al-Falih said the Houthis attacked two Saudi oil tankers in the Red Sea on Wednesday, one of which sustained minimal damage. A senior oil source said Saudi Arabia had already beefed up security and that all crude vessels in the area are accompanied by warships. Saudi crude exports through Bab al-Mandeb are estimated at around 500,000-700,000 b/d. Most Gulf oil exports that transit the Suez Canal and SUMED Pipeline pass through the strait. Industry and shipping sources said the suspension was unlikely to impact Saudi crude supplies to Asia, but could add shipping costs to Saudi vessels heading to Europe and the United States due to a longer transit. Traders said the suspension order was only for Saudi-owned vessels, so Saudi Aramco could still charter foreign ships to move its crude. Saudi Arabia also has a 5 million b/d pipeline route to the city of Yanbu on the Red Sea which bypasses the Strait. The latest price rally is particularly good news for Saudi Arabia, whose budget deficit this year should to shrink to 5.6 percent from 9.3 percent last year. Saudi Aramco, the main revenue source for the Kingdom, is rumored to be seeking a majority stake in one of the world’s largest petrochemical giants – SABIC. Saudi Aramco is said to be weighing use of the international bond market for the first time to finance the acquisition of SABIC, a move into global capital markets that could offer an alternative to an initial public offering of Aramco stock. If Aramco goes ahead with an international bond — potentially among the biggest ever done by a corporate issuer — the sale would force Aramco to disclose its accounts to investors for the first time since nationalization 40 years ago as well as many other details about oil reserves and operations. As the U.S.-China trade war escalates and policymakers around the world warn that tariffs and counter-tariffs could weaken global economic growth, China is looking to boost its economy with measures to expand domestic demand and promote investments, including in infrastructure. Last week, Beijing announced a mix of tax cuts and infrastructure spending citing “uncertainty,” as it increases efforts to stimulate demand and counteract a weakening economy. The move, late Monday, came the same day as an injection of $74 billion into the banking system by the People’s Bank of China— the central bank’s largest ever, single-day cash injection using that tool. These moves provide growing evidence that China’s policymakers are concerned about how the trade war with the US will exacerbate a domestic slowdown and follow a series of monetary loosening actions in recent weeks. 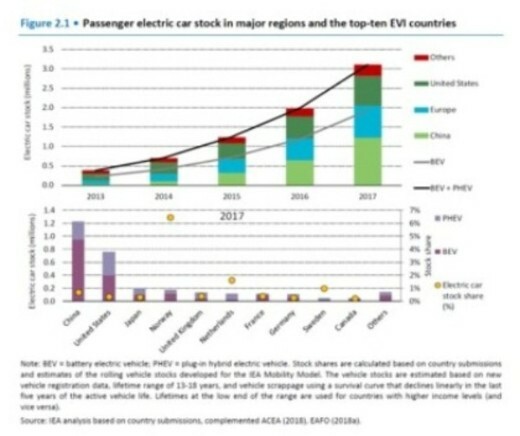 The EIA’s International Energy Outlook 2018 points out that China’s energy consumption is tied to both its rate of economic growth and the size of its energy-intensive manufacturing industries. Chinese policy goals call for a move away from heavy industry toward a less energy-intensive economy with a greater focus on service industries suggesting that the pace of growth of its demand for oil could be slowing in coming years. Moscow’s oil production this year will increase to 11.02 million b/d, a new 30-year high, Energy Minister Alexander Novak said on Wednesday. He said Russia would further raise production to somewhat higher in 2019 after OPEC and other oil producers agreed last month to ease production curbs. Last year Russia’s oil production reached a new 30-year average annual high of 10.98 million b/d despite the country’s participation in the OPEC agreement. While “new highs” may sound impressive, the 300,000 b/d increase is not that significant when compared to increasing global demand of circa 1.5 million b/d. The IMF recently called the economic crisis in Venezuela “profound” as a substantial drop in oil production takes its toll. The Fund noted that real gross domestic product for Venezuela is on pace to drop 18 percent this year, the third year in a row for a double-digit decline. Racing to keep up with hyper-inflation which the IMF forecasts will hit 1,000,000 percent this year, the Venezuelan government announced that it would knock five zeros off its currency, the Bolívar — not the three it had previously planned. Even after the new bills come into circulation, they will not be worth much. At the current rate of inflation, which the opposition-controlled National Assembly estimated at an annualized 46,305 percent in June, the highest denomination bill would be worth only $6 by the end of August. By the end of this year it would be worth 20 cents. President Maduro also announced that part of the country’s oil reserves in the Orinoco Basin would be transferred to the central bank and would be included in the country’s international reserves. This move could be symbolic, designed simply to inflate the reserves number, or the government might be planning to convert ownership of the oil reserves into a tradable asset. “This would be tantamount to the government’s selling the country’s oil under the ground as a source of financing.” Venezuela currently is in the midst of one of the worst economic meltdowns in Latin American history.